What a spectacular ending to Act III this was, equalled in my recent memory only with Barenboim in the same production at La Scala in December 2010. His sensitive handling of the orchestra framed those hugely gentle scenes between the sympathetic Wotan of René Pape and the intensity of Iréne Theorin as his daughter Brünnhilde, when for example when he tells her she is the daughter of the world’s wisest woman, and later when she coaxes him away from consigning her to a fate worse than death. These were tranquil and beautiful moments, as was the encounter between Brünnhilde and the noble Siegmund of Peter Seiffert when she announces his impending doom. Yet all the singers came over with great force at times of high drama. Peter Seiffert’s cry to his lost father, Wälse! Wälse! in Act I had huge lyrical force, with the orchestra at full tilt, and Waltraud Meier gave Sieglinde a sublime intensity after Brünnhilde dissuades her from death by telling of a Wälsung in her womb. Rette mich Kühne! (Rescue me brave one) had tremendous lyrical force, and when Brünnhilde gives her the shards of the sword, and names him Siegfried, O hehrstes Wunder floated high above the orchestra, ascending to the gods themselves. These great turning points in The Ring are powered by forces that Wagner extracts from deep mines of cultural history, but he sets it all going in dramatic style with that wonderful Act I. 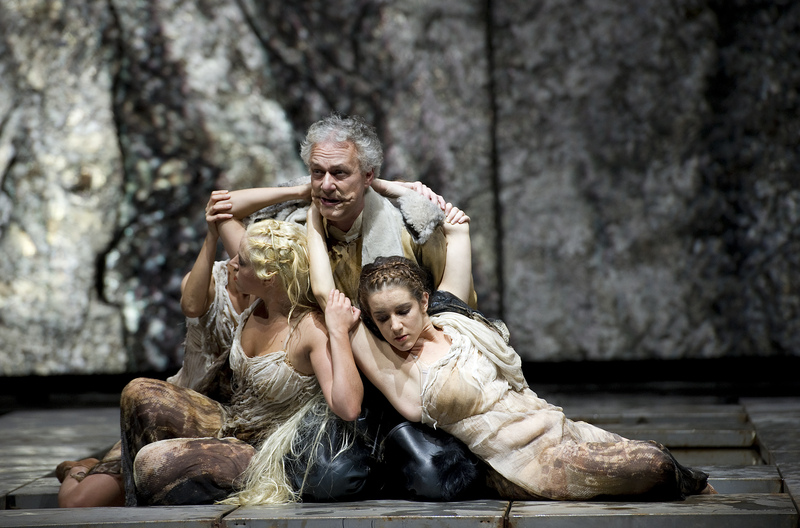 Here Seiffert and Meier beautifully vocalised their mutual passion, and the strongly youthful Hunding of Mikhail Petrenko represented the determined world of honour killing, supported by the fiery Fricka of Ekaterina Gubanova. And when Hunding kills Siegmund in Act II he does not merely fell him with a sword, but thrusts a spear through his body as it lies on the ground. As he stands victorious on stage-right, Wotan on stage-left quietly commands him to kneel before Fricka. He remains motionless, and as Pape firmly emphasises the second Geh! he falls dead. Earlier in Act II, Pape showed utter exhaustion after telling Fricka she could take his oath, and his beautifully crafted portrayal of Wotan’s self awareness allowed him to project huge power in the final moments of Act III. As the music crescendos, his Leb’ wohl! 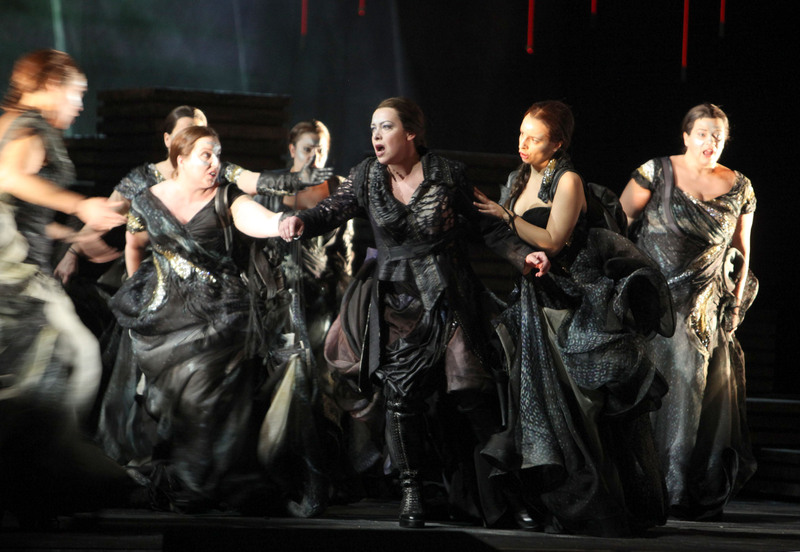 to Brünnhilde swept with huge power through the orchestral sound. After the final bars the audience gradually recovered from the magic, and the sustained applause took in more than one appearance on stage by the full orchestra, and numerous curtain calls for Barenboim and the soloists, including the Walküren in their voluminous dresses. Immensely cumbersome though Tim Van Steenbergen’s costumes may be, they are effective, as is this whole production by Guy Cassiers with lighting and assistance on set design by Enrico Bagnoli. Thank goodness the dancers from Rheingold were entirely absent, leaving us to savour the heart and soul of the music. 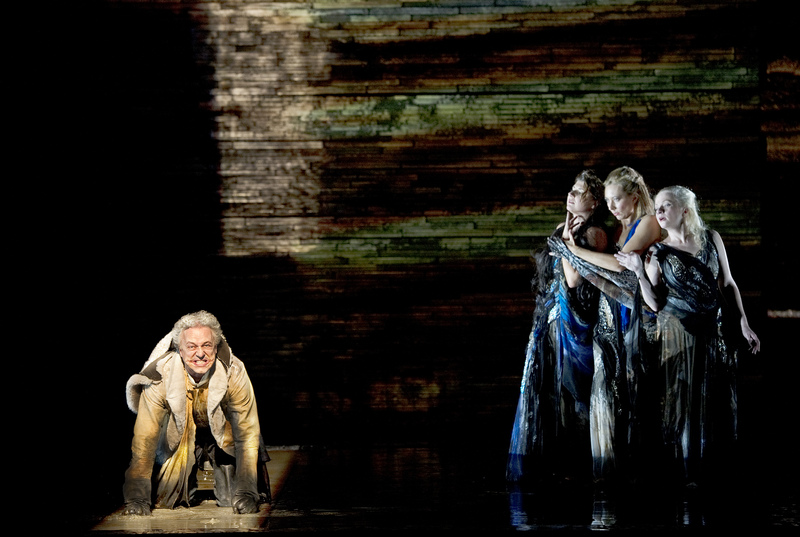 This performance was on April 5, and Siegfried continues on April 7. The mighty cathedral in Milan — the third largest in Europe after Seville and Rome — contains vast columns reaching up to an immense height. Nearby is La Scala with its four tiers of boxes ascending to two further tiers of row-seats, and during the final curtain calls the performers looked heavenwards to right and left, relishing the applause from the gods, while Daniel Barenboim, who conducted a magnificent Walküre, waved to the rafters. What a performance it was, in a new production by Guy Cassiers, with simple abstract sets by Enrico Bagnoli, and clever video projections by Arjen Klerkx and Kurt d’Haeseleer. 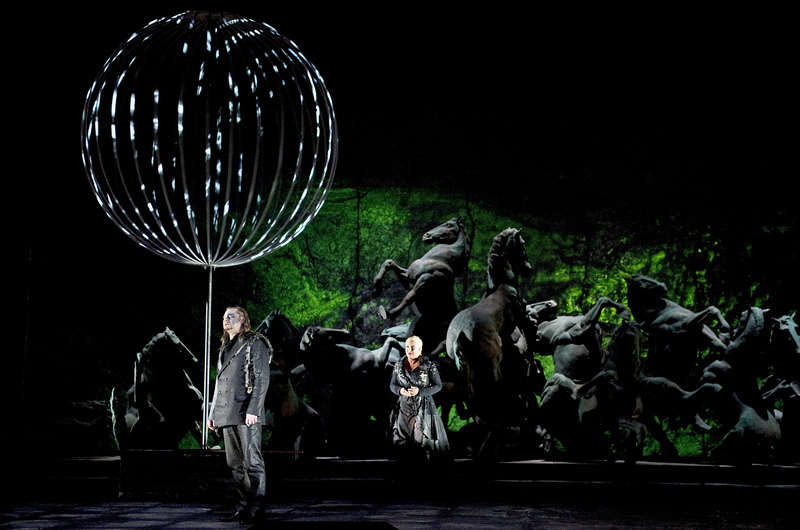 La Scala has seen its share of Verdi operas with their powerful family relationships, but Wotan and his daughter Brünnhilde in Wagner’s Die Walküre is the equal of anything in Verdi, and here we had a young and glorious Brünnhilde in Nina Stemme. In the final scene, embraced by her father, with warm reddish light falling on her bare shoulders, she was the perfect sleeping beauty to be surrounded by fire until woken by a mighty hero in the next opera of The Ring. That hero has yet to be born, but at the end of Act II, Brünnhilde drags his mother Sieglinde — magnificently sung by Waltraud Meier — away from the fatally wounded body of her lover and brother Siegmund, powerfully sung here by Simon O’Neill. After they leave, Sieglinde’s abandoned husband Hunding thrusts his sword deep into Siegmund’s dying body. This is too much for Vitalij Kowaljow’s sympathetic Wotan, father to Siegmund and Sieglinde, and with the emphasis on the second Geh! he sweeps a hand sideways, and Hunding falls dead. But what a Hunding this was, with his rich dark tone — the best I have ever seen — sung by Britain’s very own John Tomlinson. Wotan, of course, threw the battle to Hunding after his wife Fricka demanded it. She was strongly sung by Ekaterina Gubanova, and after his argument with her, his declamation “In eigner Fessel fing ich mich, die unfreiester aller!” (In my own bonds I’m trapped, the least free of everyone!) was strongly delivered with perfect diction. 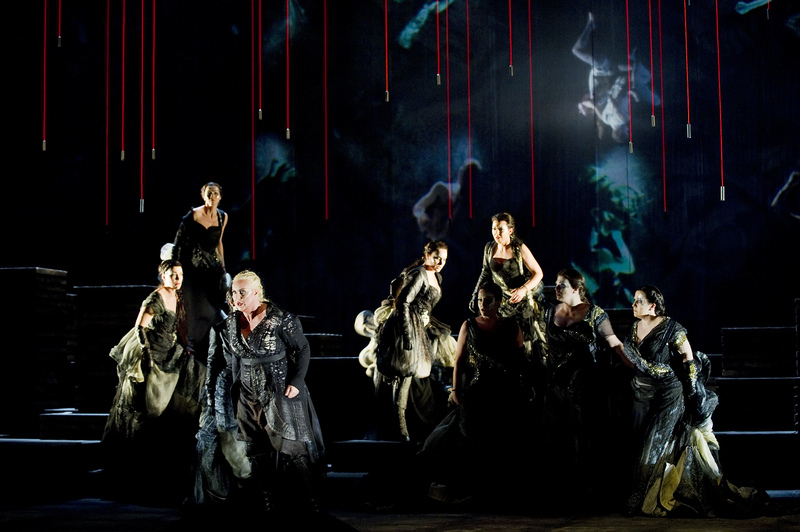 The appearance of the nine Valkyries at the start of Act III, in voluminous black dresses by Tim Van Steenbergen, was very effective. At this point, Sieglinde yearns only for death, but suddenly comes to life after Brünnhilde foretells her pregnancy. Her “Rette mich Kühne! Rette mein Kind!” (Rescue me, brave one! Rescue my child!) filled the auditorium, and her final “O herhstes Wunder! Heiligste Maid!” sailed over the orchestra and up to gods. This was more than a miracle, it was opera magic, and at the end of the final act as red lighting bespoke the fire that would encircle Brünnhilde, an asymmetrical collection of twenty-eight red lights — a mathematically perfect number — descended from above. 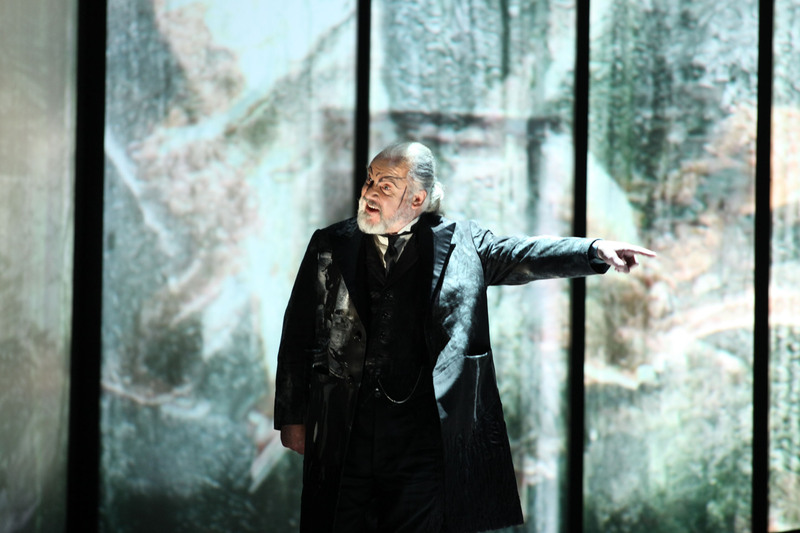 All praise to the production team and singers, but to no one more so than Barenboim, whose nuanced conducting brought out the full depth and passion of Wagner’s music. For a more concise version of this review see the Daily Telegraph on 24thDecember.